One of my favorite parts of having a paper quilling blog is to share fun new quilling supplies that I have tried! Most of the time I purchase them myself, try them out, and give my review. But occasionally I am contacted by companies that offer to send me their products so I can try them out and let people know about them. I am more than happy to do so as long as the products are interesting to my readers and have something to do with paper quilling. And of course my stipulation is that I must give my personal honest review!! 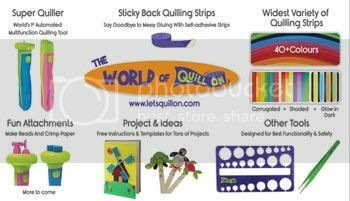 About a month ago I was contacted by a new paper quilling company in India called Let’s Quill On. They have a professional looking website with great products, some which are brand new to the quilling scene. One of their fun products is their electric slotted quilling tool. There are a couple other of these on the market around the world as well, though I haven’t personally tried any yet. A unique feature of the one from Let’s Quill On is that you can get another top for your tool that acts as an electric crimper. Sounded good to me! The company generously sent me one of their kits, which are great for kids. Since Svara loves quilling and she’s 9 years old, this kit was perfect for her! It came with the super quiller electric slotted quilling tool, the crimper top for the tool, tweezers, circle sizing guide, LOTS of strips of paper (800! ), and the other supplies needed for the projects included in the kit such as stickers, googly eyes, glue, etc. We received the kit less than a week after it was sent, which was very fast! Upon opening the box I was definitely impressed by the quality of the products. The packaging and supplies are professional, colorful, and fun! Svara couldn’t wait to get started! Here Svara is starting the unpacking. Intrigued by the Super Quiller! Of course Svara had to take everything out of the box to see all the goodies! The supplies for the kits are each packed separately, so it’s easy to choose a project and get started! Here is a photo of the end of the paper with the sticky part. You roll the paper as usual, and when you are ready to close up your roll, just take off the little white slip and stick the end of the paper to the roll! I liked that the tweezers do not have super sharp points, but are still plenty pointed to work with quilling. It makes them safer for kids! Svara chose a project and got started. The instructions are colorful, clear, and well laid out. The first project Svara worked on is a 3D frame with sea creature decorations. The instructions tell you which colors to use, but for some of the creatures Svara changed up the colors and that worked fine as well. The kit comes with plenty of color choices! This was our first time using an electric slotted quilling tool. We quickly discovered that you need to hold the paper in place while spinning, otherwise it’ll spin all over the place as you can see in the photo below! But once you get the hang of it, it’s easy. Just insert the paper strip and keep your fingers close to the spindle while it spins and the paper will roll up easily and super quickly! One of Svara’s pet peeves about quilling is that it takes a lot of patience to roll strips. But with this it goes much quicker and she appreciated that!! The crimper uses the same base as the slotted tool. You need to pop off the top of the Super Quiller, add on a little gear and pop on the crimper top. The little gear makes the tool grab to the inside of the crimper gears, making them turn. The instructions did say that sometimes you need to take the crimper top on and off a couple times to get the gears to engage. They have to be in the right position to work. Sometimes you get lucky and it works on the first try, other times it can take awhile to get it to work. And we found that sometimes in the middle of the crimper working, it would just stop. Sometimes if you tapped it against your hand it would start working again and other times you had to take the top off and on again. Svara quickly discovered that it’s easier to make all your crimped pieces, and then all your regular rolled pieces, instead of continuing to switch the top of the tool back and forth. And actually after awhile she got frustrated with the crimper top not always working and she started just using the tool for regular rolling. For crimping she switched to using a regular crimping tool that we have. Here is Svara’s first project, all finished! She’s working on the others and deciding who to give them to as gifts. It’s always great to get homemade gifts! I would definitely recommend this kit, or any of the quilling supplies, from Let’s Quill On. The kits are especially appealing and fun for kids (they have another kit that is more robot/animal centric rather than the princess centric theme of the kit we received). The website even has a great projects area with tutorials for all sorts of projects from frames, to jewelry, to pencil containers and more! Click here to view their project tutorials. Where Can You Get the Tools and Supplies? Let’s Quill On is based in India, so those of you in India can easily order directly from their website, and usually with free shipping! If you are outside of India, not to worry, they ship all over the world! With the very reasonable prices combined with good shippings rates from India, it’s worth checking out no matter where you live! I love how on the page with the colors of their quilling paper they have a little quilled item made with that color next to the strips themselves. It’s the little things that can make a big impression when selling craft supplies! 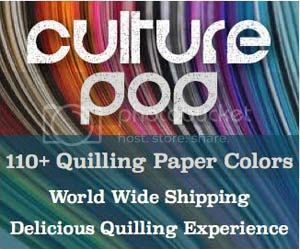 Amazon – If you are in the US and you prefer shopping on Amazon, you can get the Super Quiller (in pink or blue), the crimper top in pink or blue, the paradise kit or factory kit, and a pack of 1,200 quilling strips right from your favorite online shopping source! I hope you enjoyed this review. If you have any questions about these products, let me know. Stick around, there is lots to see on the blog! *The quilling kit in this post was sent to me free of charge from Let’s Quill On. All opinions and descriptions are my own. *Some of the links on this page are affiliate links. That means I get a portion of the sales from those links, at no extra cost to you. Thank you for supporting my website!